MILWAUKEE (AP) Giannis Antetokounmpo scored 33 points to help Milwaukee overcome Lonzo Ball’s triple-double in the Bucks’ 98-90 win over the Los Angeles Lakers on Saturday night. Ball became the youngest player in NBA history to record a triple-double when he had 17 points, 13 assists and 12 rebounds. At 20 years and 15 days, he bested LeBron James by four days to become the youngest to accomplish the feat. The Bucks maintained a double-digit lead throughout most of the fourth. After the Lakers pulled within seven with just over five minutes left, Antetokounmpo threw down a dunk while being fouled. He made the free throw to grow the Bucks’ lead back to 10 points. 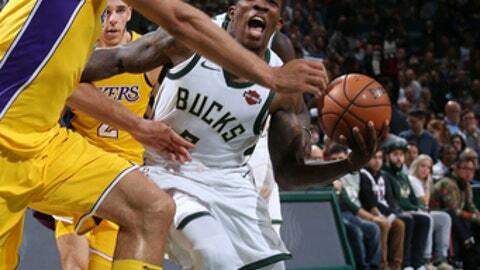 He followed with a twisting layup on the next possession as the Bucks gained control. Lakers: Coming off a game in which he made just one of seven three-point attempts, Ball began by draining both of his 3-point attempts in the first quarter. … The near-capacity crowd booed Ball nearly every time he touched the ball early in the game. ..G Vander Blue, last year’s D-League MVP, entered the game in the second quarter, seeing action at the Bradley Center for the first time since playing for Marquette University in the 2012-13 season. Bucks: Mirza Teletovic missed a second consecutive game with left knee soreness. Coach Jason Kidd said he doesn’t expect Teletovic to return to practice until Wednesday. .Milwaukee played its third set of back-to-back games this season. Lakers: At Phoenix on Monday night. Bucks: Host Memphis on Monday night.